Aleksandar Svetski knows that there are no shortcuts to success, but through Amber, you can build on what he’s already learned. We all want to be millionaires, so what exactly are the three simple steps to becoming a millionaire? Aleksandar Svetski says there are none. 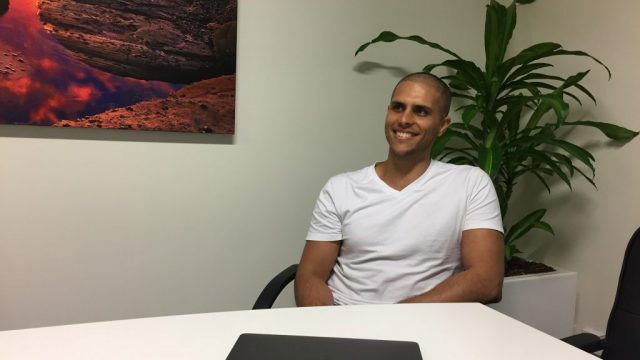 Aleks is co-founder and CEO at Amber, Australia’s first app to combine a digital currency exchange, wallet and round ups, allowing anyone to swap the spare change from their everyday transactions into Bitcoin – on auto-pilot. Aleks told himself that he would be a millionaire by the age of 20. Was he a millionaire by this age? Not quite. With HSC results in the top 1% of the state, Aleks was granted early entry and a scholarship to the University of Wollongong. Once discovering university was not enough of a challenge, he taught himself to trade derivatives (stock market) and managed to turn his $3,000 scholarship into over $50,000. The drive to be an entrepreneur far outweighed the university dream for Aleks. “Everybody makes out like being an entrepreneur is a nice, easy thing to do. They think there are three steps to becoming a millionaire. It’s really hard and there’s a really difficult side to it,” he said. This initial setback led him down the entrepreneurial path. Desperate to pay off his debts, Aleks found himself door knocking. “I sold anything I could, and at one stage was the third-best pay TV salesperson in the country, although I didn’t have a TV at the time and I lived on someone’s lounge floor on a mattress. It’s amazing what necessity does,” he said. A number of years later, after having successfully rebuilt himself financially, Aleks took a sabbatical. Throughout his career, Aleks has successfully built and run companies in industries as diverse as sales, renewable energy, tech and now more specifically, Fintech. Aleksandar was first introduced to Bitcoin in 2012, but wasn’t interested and did not get involved until later on in 2015. That all changed, and in 2016, after stepping down as CEO from a prior tech company, Aleks went down the proverbial Bitcoin “rabbit hole”. So what exactly is Amber? In the words of his friend, who so aptly put it: “Amber is like crypto for dummies”. It’s like a digital piggy-bank, on auto-pilot. Will Amber offer more than just Bitcoin? The team closed a $280,000 pre-seed in January 2018 to prove that they could build it, and as of this writing they’re $900k of the way through a $1 million seed round to commercialise the product and get it into the hands of the first 10,000 users in Australia. Amber is Australia’s first fully integrated digital currency exchange, wallet and micro-investment app, so not only can you buy with your spare change, but you’ll be able to store, swap, send and sell. Spare change – rounds up transactions to the nearest dollar. Boost function – allows you to add an extra 50c or extra dollars to every transaction. Recurring – allows you to set a certain amount of money to go in every week. One off – allows you to put “one-off” large transactions into the wallet. The biggest achievement with Amber so far Aleks says is raising $1 million dollars without an ICO, right during the peak period. “It took alot of self control not to go down that path, and I’m glad we didn’t,” Aleks said. When companies are raising capital via an ICO, the investor is not buying any of the company, they are buying a token that will “one day” pay for work on the network, and thus functions like a currency upon that network. Two years on from the initial idea and Amber will be going live with a soft launch for Christmas. Click here to download the app, or sign up to their mailing list and know when it goes live. In five years’ time where will Amber be?